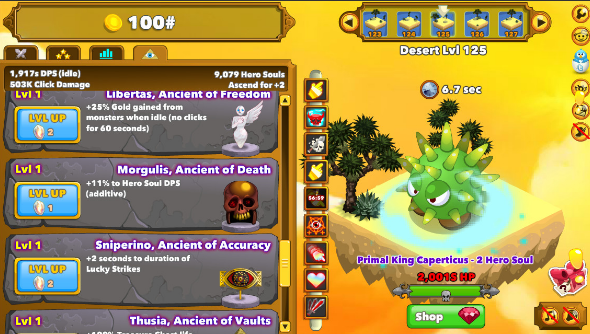 Why on earth is half the planet playing Clicker Heroes? Are you one of the 38,000 people playing Clicker Heroes today? That’s an absurd amount of players, making it currently the sixth most played game on Steam. The game has only been out five days and it’s already some kind of phenomenon with its own Reddit page. But why? It is, quite literally, a game where you click on things until they die. And I don’t mean in the Diablo way, where you have to position yourself and manage health and mana. 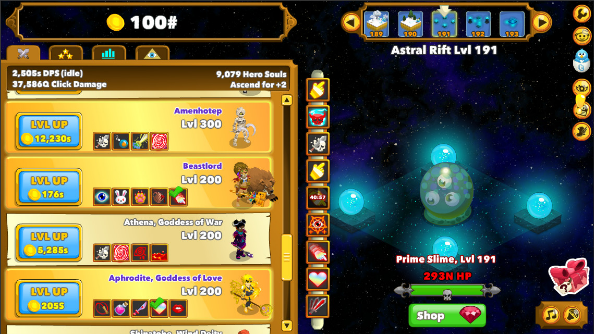 Clicker Heroes at its most complicated is selecting a new world to click on monsters in. Why has this captured the PC gamer’s imagination? Clicker Heroes is free to play, so if you want to see what I’m talking about just grab it from Steam. It’s 80mb big, so you’ll be playing in a couple of minutes. The interface is split into two halves, the side with some information in, and the side with the monsters in. Click on the monsters (or anywhere kinda close to the monster, it doesn’t really matter) and their health will chip down and then they die. Don’t worry, the monsters don’t attack. They just sit there like cabbages and take whatever you hit them with. When they snuff it they drop gold, and you can use this to buy stuff. The stuff you buy is new Heroes, or upgrades to heroes so they do more damage. The more heroes you recruit, the more damage you do per click. But the funny thing is, you don’t even have to click. Clicking just makes them die faster; the moment a monster spawns, it starts taking damage. You can simply leave the game running in the background and it will play itself. There’s a couple of things that prevent the game from being automated. Each ‘area’ (see: different coloured patch of ground the monsters spawn on) requires you to kill ten monsters before the next unlocks. You have to physically select the new area to proceed, otherwise the current area will just continually spawn monsters. And then there’s bosses, which are on timers and need to be killed quickly, thus requiring rapid clicking. But for the most part the game is content to plod along, collecting gold for you to invest in new heroes when you remember to come back to it. There’s a microtransaction store that turns up about twenty minutes into play, should you fancy paying real money for the game to click harder for you. I… I just… I don’t even know what to say. I missed the Cookie Clicker phenomenon, but this seems to be the same thing, just with microtransactions. The ‘very positive’ Steam rating seems largely ironic, but that’s not stopping thousands upon thousands of people playing the damn thing. Is the clicking therapeutic? Is the lure of Steam Achievements really that much? For the love of all that’s holy, please will someone explain why half the planet is playing Clicker Heroes?